Will Verizon Take on Netflix and Others with its own Streaming Video Service? Verizon is planning to launch a standalone video streaming service for 2012 that would offer movies and TV shows via the Web, according to several people close to the plan. Verizon may be concerned about cord cutters and competition from Netflix, Amazon and Google. Having its own streaming service would allow Verizon to grow its customer base and thereby lower its programming costs. New platform from San Francisco-based Veokami aggregates user generated videos of concerts. Veokami crawls YouTube and automatically puts together a playlist of videos from a single concert. Videos are then synchronized with each other to offer Veokami users the ability to switch between the different camera views that were found on YouTube, without interrupting the flow of the music. Clips can also be arranged based on audio and video quality. The company’s site also suggests the tool could be useful for organizing videos from political events and conferences. Is Skype Co-Founder Gunning for Netflix with Subscription Vdio? Janus Friis, co-founder of KaZaA, Skype, Joost and Rdio (with partner Niklas Zennstrom) is working on a new online video subscription service that will be available soon in the UK. According to GigaOM, Friis has been “assembling an A-team of media and Web technology experts to launch a site that seems destined to replicate the model behind their music subscription site Rdio in the video space.” Offices have been set up in Santa Monica and Europe. From the follow-up Q&A: Vdio (Vee-dee-o) is in closed beta for the UK and is privately funded, while the assembled team’s experience comes from companies such as Netflix, Microsoft, TV Guide and Napster. A spokesperson for Zennstrom’s VC company Atomico confirmed that Zennstrom is not involved in the project. Netflix has announced it will drop its controversial plan to split its streaming and DVD businesses, taking recent public outcry (and negative Wall Street reaction) into consideration. Netflix’s stock was up 6.8 percent yesterday following the announcement, giving it a market value of $6.57 billion. In his evaluation of current offerings, David Strom of ReadWriteWeb examined services such as Amazon Prime, Hulu Plus, Vudu.com and Justin.tv. Another upside to Netflix is the ability to use devices such as the iPad or TiVo box to stream movies. While of the services enable streaming to your Windows or Mac Web browser, they’re not all compatible with other devices. Amazon’s launch of the Kindle Fire tablet may have an impact on Netflix, since the new tablet will make it easier for users to watch streaming video content via Amazon. The decision for consumers between Amazon Prime and Netflix will likely be based on pricing and variety of content offerings. Amazon Prime beats Netflix on price, set at $80 a year ($6.67 per month), while Netflix streaming costs $8 a month. Netflix, however, has more variety of content with 51,000 titles currently available for streaming, compared to Amazon’s 11,000. Amazon may soon be able to compete in this regard with added content from Fox and CBS deals. Netflix has similar deals with Fox and CBS and a new DreamWorks Animation deal, but it will lose movies from Sony and Disney with the loss of Starz. Both companies may press Hollywood to license more content for streaming, but continuing to pay more for films could potentially break Netflix, while Amazon has other sources of revenue to cover costs. Spotify has been drawing a great deal of media attention this week, more so than the growing number of other streaming music services. Since the company announced its partnership with Facebook at the recent F8 event, Spotify has gained more than one million new users, despite the public outcry from those who question limiting the service’s signup to Facebook users only. In response to concerns regarding Facebook’s media-sharing philosophy, Spotify released a new update that enables users to access the Facebook app without sharing their listening habits, reports Digital Trends. This may be good news for subscribers not happy with the recent announcement regarding Facebook integration — and could potentially serve as a model for how others offer access to services via social networking. In related news from The Hollywood Reporter, Spotify recently released a radio feature in the U.S. that has long been available to European users. Radio will be accessible on the desktop client, but not on the Spotify mobile app. The add-on is reportedly in no way a Pandora killer, due mainly to its lack of mobility and attention to detail. American consumers cumulatively watched about 2.5 billion minutes of online ads in August, according to a new report released by comScore. The report indicates that 86 percent of U.S. Internet users watched at least some online video content last month, and more than half of that content was accessed via YouTube. Also worth noting: Facebook, already the largest photo site on the Web, was the third largest video site in terms of unique viewers. The rankings “find Facebook retaining third position in August, with 51.6 million unique viewers, trailing VEVO in second (with 62 million) and Google Sites (i.e. 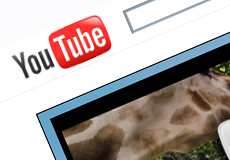 YouTube) at 162 million,” reports TechCrunch. According to comScore, video ads accounted for 13.4 percent of all videos viewed — and Hulu generated the highest number of video ad impressions (996 million in August alone), compelling figures for advertisers when you take into account that Hulu does not allow you to skip over videos. YouTube added several new tools for video creators this week, as part of its “ongoing goal to foster the creation of great video content,” explains the company’s Broadcasting Ourselves blog. The first tool, currently in beta, converts 2D video content into 3D. YouTube admits you’ll get better results with a 3D camera, but this is at least an option for those without one. Finally, YouTube gives creators the ability to add effects and text using Vlix, and adds Magisto, which will automatically take your unedited video and create a short clip complete with music. Netflix announced a partnership with Facebook to allow members to share what they are watching on Netflix with their family, friends and associates via the social networking site. However, this feature will NOT be available in the U.S. (only in Canada and Latin America) due to a 1988 law that makes sharing that information illegal. The Video Privacy Protection Act (VPPA) was created to prevent “wrongful disclosure of video tape rental or sale records (or similar audio visual materials, to cover items such as video games and the future DVD format).” Congress passed the law after Robert Bork’s video rental history was published during his Supreme Court nomination. According to Wired, Netflix currently has 24 million subscribers inside the U.S. and only a million subscribers internationally.